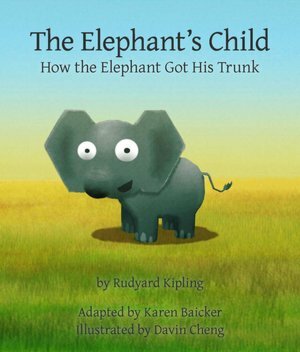 The Elephant’s Child: How the Elephant Got His Trunk is a free eBook from B&N. The narrator is awesome. He sounds like he should be narrating a PBS nature show. About elephants. Poor baby elephant has bad role models and absentee parents. All the animals of the savannah keep telling him to stop asking questions. The Kokoloko bird, channeling coyote or raven, sends the little elephant off to go ask a crocodile what he eats for dinner. CHOMP. This is a slightly more violent tale than I would normally abide for my own little elephant, but it IS Rudyard Kipling, and he DOES hearken from the days of yore when cautionary tales were sprinkled with chomping crocodiles, child-eating witches and poisoned apples. In the end, though, the elephant ends up with a dextrous schnozz and shares his story with the nasty creatures who wouldn’t answer his questions earlier in the story. Such is the love of a child. FYI: Did you know that the term pachyderm is now obsolete? It’s true! Wikipedia told me so. Posted on January 4, 2012, in eBook, eReader, Review. Bookmark the permalink. Leave a comment.